The late 1200s were “interesting times” in Italy (as the Chinese say when they want to curse an age). Frederick II of Hohenstaufen, the greatest anti-papal emperor in the history of the Holy Roman Empire was dead and his kingdom of Sicily had been taken over by the Angevin French with the spiritual, financial and armed support of the Papacy in Rome. Things were looking up for the Eternal City as various important families jockeyed to get relatives elected Pope and to build churches and commission artists to decorate them. Then, rather suddenly, it all changed: Pope Boniface VIII died in 1303 (and promptly went to Hell, according to Dante) and subsequent familial infighting in Rome led Clement V (born in France and Pope from 1305-1314) to move the Holy See to Avignon, where it stayed for 75 years. One thing to emerge (from studying who got what commissions in Rome in the late 1200s and early 1300s) was that Cavallini was not particularly well regarded by his contemporaries. He was out of step with the reigning archaism of religious art in Rome at the time—that is, the tendency to reproduce the Byzantine style of early Christian art. Cavallini abandoned that style and replaced it with solidity; his life-likeness and three-dimensionality (at times, almost bulky like a piece of sculpture)—marks of “naturalism”—were out of step with his times. He did not get as many commissions as he deserved, and that, together with general dearth of commissions in Rome combined to make him leave Rome for the Angevin court of Naples just as the throne of Naples passed to Robert the Wise, a great patron of the arts remembered by both Petrarch and Boccaccio as a man of culture and a generous patron of the arts. It was a time when major religious buildings in Naples such as the church of San Domenico Maggiore and Donnaregina (new) were still under construction, and when even the Duomo, itself, was just a few years old and still being decorated. Naples was a fertile and welcoming place for artists such as Cavallini. There are three extant documents in the Naples archives that speak of commissions and payments in favor of "magister Petrus Cavallinus de Roma pictor " in 1308 and 1309. Although there is some difficulty in properly attributing art to specific artists from that period, there is no doubt that Cavallini worked during his ten-year sojourn in Naples. Reliably attributed to him are the frescoes in the Brancaccio chapel in the church of S. Domenico Maggiore, dated to 1308. These frescoes, restored in 1960, had partially faded but are now visible. They are The History of Saints Andrew and John, on the back wall; The Martyrdom of St. John the Evangelist as well as a Crucifixion, on the left wall; Stories of Mary Magdalene as well as a Noli me tangere, on the right wall. Still in the church of San Domenico Maggiore, in the fourth chapel on the right, there is a fragment of Cavallini's rendition of the father of Christian monasticism, Anthony the Abbot. In the church of S. Maria Donnaregina, Cavallini also worked on the decorations of the nave, the triumphal arch and the Loffredo chapel, completed in 1317 and 1318, although it is difficult to attribute these items with precision. Some murals in San Lorenzo Maggiore in Naples may also be by Cavallini. Some items in the Naples Duomo are attributed to Cavallini: the recently discovered frescoes in the Tocco chapel and a rendition of St. Asprenas, both of which are stylistically similar to Cavallini's work in the church of Santa Cecilia in Trastevere in Rome. Also, in the "church within a church" in the Duomo —that is, Santa Restituta— there is a fragment of The Last Judgment as well as a rendition of St. Nicolas in the Minutolo chapel. There are a few other "iffy" attributions to Cavallini in Naples, such as the portrait of Umberto d'Ormont now in the Archbishops' residence across from the church of Donna Regina. 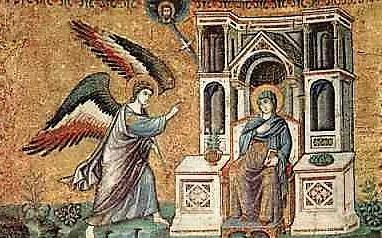 Other difficult attributions in the Campania region of Italy include frescoes in the apse of the church of S. Salvatore a Capua; some frescoes in the church of S. Angelo d'Alife in Caserta; the Dormitio Virginis in the church of Santa Maria a Piazza ad Aversa in the province of Caserta; and the giant St. Christopher in the 13th-century chapel of the convent of Santa Chiara Vecchia in Nola, near Naples. Cavallini returned to Rome and was again working there by 1321. Cavallini’s reputation at his death had increased steadily, and he was given the honor of a burial in San Paolo fuori le Mura in Rome. Interestingly, his reputation went into decline after Giorgio Vasari’s Le Vite delle più eccellenti pittori, scultori, ed architettori (Lives of the Most Excellent Painters, Sculptors, and Architects) was published in 1550. (Vasari was notoriously biased in favor of Florentine art; he explained away the Roman Cavallini as one of Giotto’s pupils. That is almost certainly not the case, and many critics, if anything, now turn it around and say that Cavallini influenced Giotto. Indeed, it has even been put forth that the frescoes in Assisi in the cycle of the Life of Francis might be by Cavallini, although some say it was Giotto and yet others say that the creator was an anonymous Master of Assisi. * Me? I don’t know.) The discovery of Cavallini’s Last Judgment in the Santa Cecilia church in Rome in 1900 started the current historical reevaluation. -Paul Hetherington. “Pietro Cavallini, Artistic Style and Patronage in Medieval Rome” in The Burlington Magazine, Vol. 114, No. 826, Jan. 1972, pp. 4-10. *I am indebted to both Prof. Barbara Saromines-Ganne of the University of Hawaii and Laura Papallo of Hartford, Connecticut for insight and information about Cavallini, especially about the debate over the Assisi frescoes.